Gaucin is a charming whitewashed mountain village, just half an hour's drive from the Costa del Sol. Gaucin is a spectacularly beautiful mountain village commanding sweeping views to Gibraltar and North Africa. The village is a gateway to the Serranía de Ronda where, depending on the time of year, you can enjoy an impressionist palette of colour: brilliant brush strokes of red poppies, yellow mimosa, purple wild orchids, tempered by the cool green of olive groves and occasional splash of pale pink almond blossom. Indeed, Gaucin is famous for its international artists' community. The town has a population of less than 2,000, and its narrow medieval streets and tall, narrow houses are sprawled picturesquely over two hills and the adjoining land between them. Perched high above the deep River Genal valley, Gaucin is overlooked by the imposing the Sierra del Hacho mountain. The village is 626m above sea level. As you would expect from the name, it is not unusual to see eagles circling the towers here, and kestrels nest in the walls of the convent. Gaucin, like many other birding sites in this part of Andalucia, has plaques around the town showing both native and migrating birds which can be seen in the vicinity. There are a number of walk in the vicinity of the village - some of these are described Guy Hunter Watt's book, Walking in Andalucia. The Walk of Melanie and the Tiger leaves the village by the signed Camino Piedras del Rio near the Castle and cuts across past the Ermita de la Adelfilla, looping round to return up the Roman road known as the 'Camino to Gibraltar'. Another interesting walk near Gaucin is described in "The Walk of Mr Henderson´s Railway"
Walking in Andalucía is a 260 page full colour guide to some of the very best walks in southern Spain, taking the walker on 34 routes - all starting and most finishing in beautiful villages. 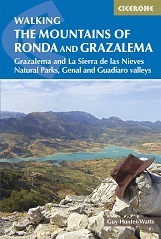 Buy a copy online of Walking in Andalucia. Hover the cursor over Gaucin to see bigger map and click to go to the maps page.